RHA's first pair of wireless in-ears are very good. They're durably and sensibly built with classy materials, the battery lasts ages and the sound is good. You can't ask for much more than that for £150. For the past few years, RHA has built itself a reputation for offering audiophile grade sound in an affordable and well-made earphone. Up until now, however, all this audio goodness has been delivered using a physical wire. With the 3.5mm jack slowly disappearing from smartphones, it's now time for the wireless solution - which is exactly where the RHA MA750 come into play. Like so many other manufacturers in 2017, RHA went with a neckband design for the MA750. As we've mentioned in the past, this design is beneficial for more than one reason. Firstly, it gives the manufacturer more space to build in better components within the neckband. Secondly, it ensures those components - most importantly the Bluetooth radio - are closer to the phone or transmitting device which is most likely going to be in your pocket. Thirdly, it means the whole weight of the cable isn't pulling down on your ears, ensuring there's enough slack to get rid of that tugging feeling, helping the cable last longer in the process. This of course means you can move your head any which way without worrying whether or not your earphones will stay in place. There's lots to like about RHA's flavour of neckbuds, but equally, there are a few irks. To get those out of the way first: we're not particularly keen on having the inline remote built into the cable between the neckband and the right earbud, as it adds a little weight to the right ear. It's not a big deal, but a collar-based system would be more comfortable. Despite this, the remote is very easy to use. The volume up/down buttons are separated by a recessed play/pause button. Thanks to it being recessed, it's virtually impossible to press the wrong button. One other design choice that might split opinion is the decision to go with an over-ear cable that you can mould to fit around the back of your ear. It's comfortable to wear, but it does mean that putting these earphones on in the first place is more fiddly than it might be without the over-ear cable. 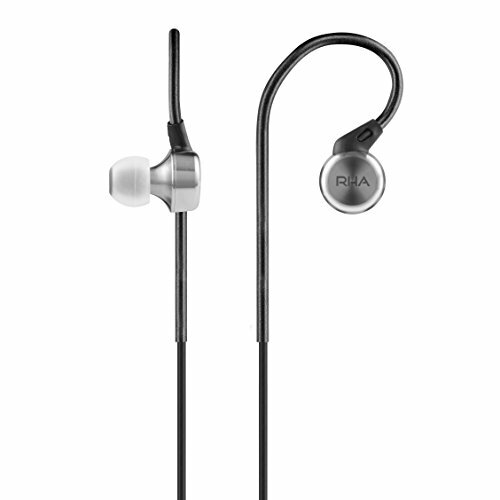 Otherwise, as collar-style earphones go, the RHA design is one with touches of class and restraint. Rather than have a large plastic collar, the neckband is predominantly a thick, insulated cable covered in a grippy silicone material. Each end of this has a cylinder housing, capped off with a stylish stainless steel ring, which is matched by the metal earbuds and the inline remote housing. The right one has the power/pairing button and a Type-C port, while the left is devoid of buttons and ports, but has the NFC logo to indicate where its chip is, for easy pairing with compatible Android smartphones. Because of the minimal and slim design, the neckband sits very comfortably around the neck, while tha rubber finish ensures it doesn't slip around. What's more, each of the two metal earbud cases is equipped with a magnet, so you can snap them together when not in use. As a bonus, they also happen to be splash and sweat-resistant. That means they'll survive the odd sweaty walk to work in the summer or accidental splash, but won't cope so well if drenched in a soggy British November downpour. What's more, as has always been the case with RHA earphones, you get a plethora of eartips to choose from in various sizes, shapes and materials. Our favourites are the Comply memory foam ear tips that squash completely flat before insertion, then slowly fill the space they're in for a perfect fit. They leave no air gaps, but don't feel uncomfortable like a snug-fitting silicone tip might. As features go, the RHA MA750 wireless are pretty basic. There's no Android or iPhone app for changing settings or anything like that. It's simple: pair with your device and get going. You also don't get active noise-cancelling (ANC), not that these buds really need it. In our testing, with the right ear tips installed, the passive noise-cancelling is excellent. This is thanks to the design of the aforementioned tips and the stainless steel Aerophonic earbuds. It's almost impossible to hear people around you in the same room when listening to your tunes. It might not completely drown out noisy crowds on the London Underground, but it will cut out enough to leave you enjoying your music without noise pollution. On the Bluetooth front, RHA equipped the MA750 wireless with aptX, which ensures that the connection is reliable and latency-free on compatible devices. As you'd expect, this meant plain-sailing as far as wireless performance goes. We had no issues with drop-outs whatsoever, and it never went out of sync when watching videos. As you'd expect, basic functions like playing, pausing, and skipping tracks is all controlled using the inline remote. You press the centre button once to play or pause, or press-and-hold it to launch Google Assistant or Siri on your relevant smartphone. Pressing the button twice quickly skips to the next track, while triple-pressing skips back to the beginning of the current track, or the previous one, depending on how much of it you've listened to. The short version in terms of features is that the MA750 gets the basic necessities right. There's great isolation, decent battery life and a solid Bluetooth connection. As for the all-important battery life, RHA promises 12 hours of constant playback before it will die. To further increase battery life, the earphones switch off when they've been inactive for 20 minutes. In our testing, the results were impressive. After four hours of listening the little battery icon in the Android quick-settings shade and iPhone status bar wasn't even down to the halfway mark, suggesting the 12 hours isn't completely unrealistic. The most important thing here is - while each use case is different - you should be able to get through a whole week listening to a couple of hours of music each day without needing to plug the MA750 wireless in to charge. On the whole, the sound from RHA's wireless earphones is balanced and well-tuned. Those hoping for clean and completely neutral tones (as per older RHA sets) may be disappointed a little, but the overall listening experience is pleasant - even if it isn't fine-tuned for the purist. The MA750 delivers sound that has well-controlled bass, yet bass that's prominent enough to add flavour and depth to the sound without taking over. You get no distortion at high volumes, and the earphones are just as comfortable playing you acoustic singer-songwriter tunes as blasting out the latest Royal Blood album. If there's any sound-based criticism, we'd like the general sound to be a tiny bit clearer and crisper. To call it muddy would be an exaggeration, but it's a tiny bit lacking in sparkle and detail - as if everything is ever so slightly muted. But then, for the price you're paying for these, that's to be expected. Which is to say, for the money, these in-ears sound very good indeed. As RHA's first pair of wireless in-ears, the MA750 is very good. Durable and well-made using classy materials, the battery lasts ages, while the sound profile is solid. Wearing them for extended periods is easy thanks to the choice of tips and the lightweight, ignore-able design, too. There are very few complaints overall. Those who crave lots of bass will want to look elsewhere, plus we're not convinced by the inline remote's placement. Still, for those wanting an easy-listening tone from a pair of long-lasting and stylish earphones, you can't ask for much more at this £150 price point. For those looking for a great all-round pair of wireless earphones without any gimmicks, the V-Moda is superb. The design is practical and light, and the sound is fantastic. These are easy to wear and deliver a great listen, too. If you're an iPhone user, the Beats X is a great option in the neckband category. You don't get the same quality sound as RHA, but you will be left with a little more money in your pocket and super-convenient pairing and connection thanks to the W1 processor. Sadly you won't get the same battery life as the RHA's. Sennheiser's Momentum In-Ear Wireless earphones were among the first neckband releases in 2017 - and are one of the better pairs out there. The design is comfortable - although a little bulkier than RHA - and the sound is brilliant. What's more, the controls are all housed in the collar, rather than dangling from your ear.